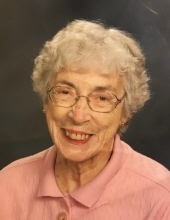 Jean E. Schroeder, 88 of Normal, passed away at 7:16 p.m. on Wednesday, April 10, 2019 at Advocate BroMenn Medical Center, Normal. Her memorial service will be held at 10 a.m. on Wednesday, April 17, 2019 at Carmody-Flynn Funeral Home, Bloomington There will be no visitation. Cremation rites have been accorded. Inurnment will immediately follow services at East Lawn Memorial Gardens, Bloomington. In lieu of flowers, memorials may be made to the Community Cancer Center, 407 E. Vernon Ave, Normal, IL 61761 or a charity of the donor’s choice. She was born January 25, 1931 in Kansas City, MO, daughter of Homer Clifford Swartz and Edna Mae Kirkpatrick Swartz. Jean moved to Bloomington and graduated from Washington School in 1944. She graduated from Bloomington High School in 1948. Her future husband Ronald W. Schroeder was a sophomore at BHS while Jean was a senior but it took several more years for them to meet again. Jean pursued a nursing degree and settled back in Bloomington where she married Ron on June 30, 1957. He preceded her in death on April 19, 2009. She was also preceded in death by one brother, Don Swartz of Huntsville, AL. Jean was a Registered Nurse at Brokaw Hospital (now Advocate BroMenn) until retiring in 1988. Surviving are four sons, Greg (Adel) Schroeder of Normal, Tom (Joan) Schroeder of Bloomington, Andy (Kevin Crandall) Schroeder of St. Louis, MO and Ken (Ann) Schroeder of Atlanta, GA and 12 grandchildren, David, Matthew, Aaron, Lindsay, Nick, Elizabeth, Mallory, Adam, Eric, Emily, Evan and Ellis. Jean enjoyed spending time with her friends, following her grandchildren's activities and cherished her time watching butterflies and birds and looking for rainbows. She was a volunteer at the Community Cancer Center in Normal, at Crossroads in Bloomington and a member of Calvary United Methodist Church of Normal. "Email Address" would like to share the life celebration of Jean E. Schroeder. Click on the "link" to go to share a favorite memory or leave a condolence message for the family.